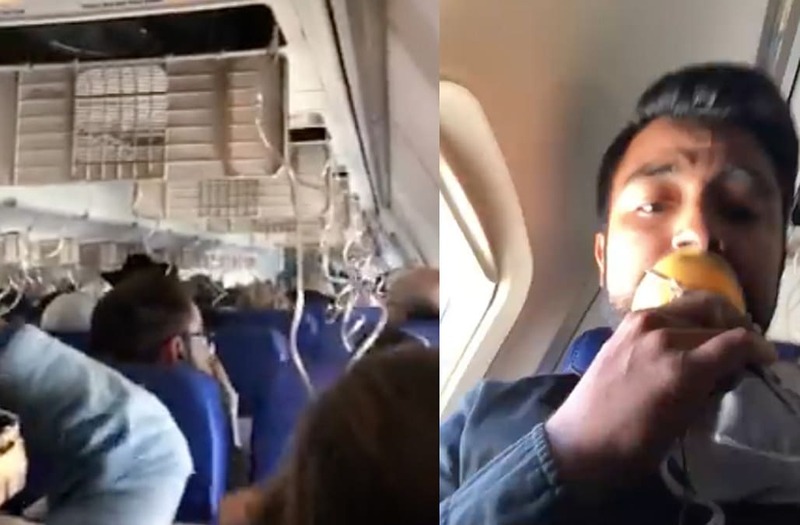 A passenger aboard a Southwest Airlines flight on Tuesday shared footage from inside the distressed aircraft's cabin depicting the moments after one of the plane's engines malfunctioned. Marty Martinez was aboard Flight 1380 heading from New York's LaGuardia Airport to Dallas when the Boeing 737 was forced to make an emergency landing at Philadelphia International Airport. Martinez took to social media during the incident using the plane's Wi-Fi to share footage of the horrific scene that unfolded, which left one passenger dead. "I literally bought WiFi as the plane was going down because I wanted to be able to reach the people I loved...thinking these were my final moments on earth," Martinez wrote on Facebook. After the emergency landing, Martinez again took to social media to share photos of the severe damage sustained by the plane, which included a blown-out window and damaged left engine, as well as a video of oxygen masks dropping from the airplane's ceiling. In the frightening footage, passengers aboard Flight 1380 can be seen wearing the emergency devices while sitting in silence as their bodies are jolted back and forth by the unsteady aircraft. "Flight 1380 From NYC to Dallas crash landed in Philly," Martinez wrote. "Engine exploded in the air and blew open window 3 seats away from me. Explosion fatally (critically, not sure her status) injured woman sitting in the seat next to the window. Oxygen masked deployed." One passenger, whose name has not yet been released, was transported to Penn Presbyterian Medical Center in critical condition following the incident and later died, according to investigators. Seven others who sustained minor injuries on board were treated at the scene.